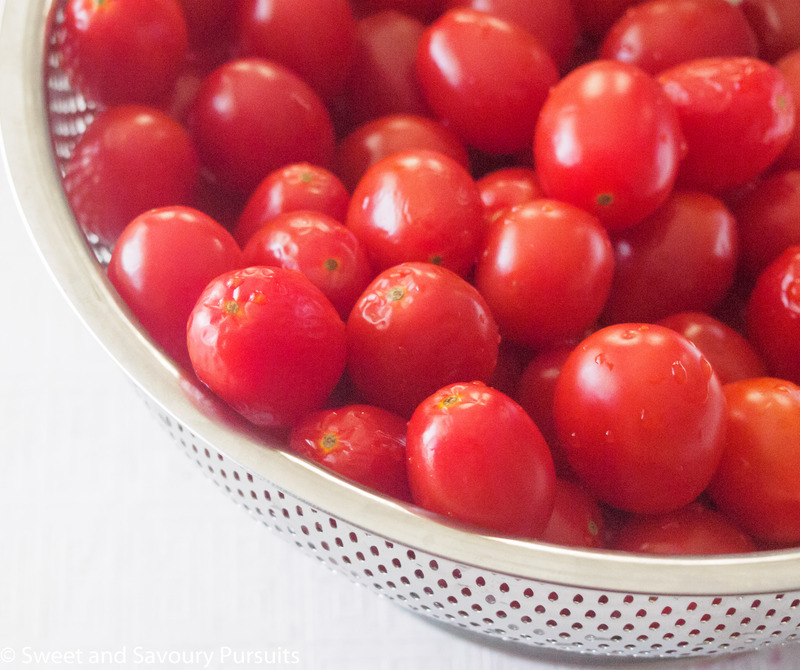 Here’s an easy and versatile recipe for Roasted Grape Tomatoes. They’re quick to prepare and can be put in the oven while you make the remainder of your meal. This post is more about photography than it is a recipe. 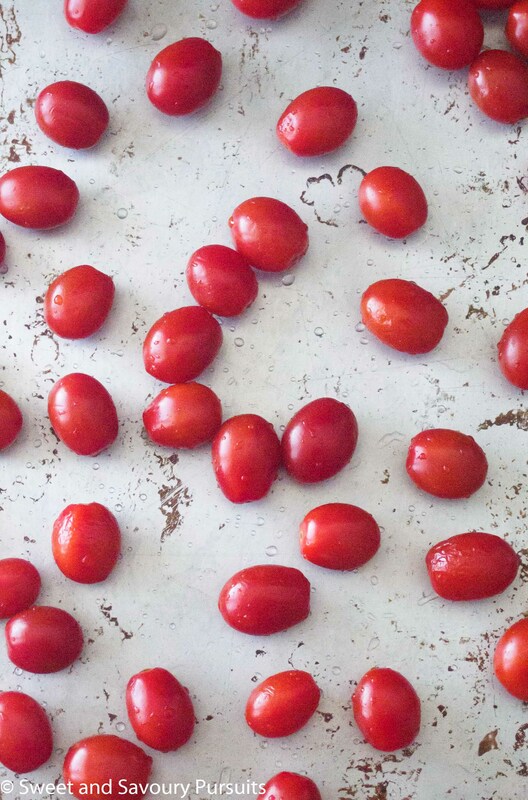 Not because this incredibly simple recipe for Roasted Grape Tomatoes isn’t delicious because it really is. It’s because as I was shooting the pictures for this post, I thought it would be fun for me to experiment shooting at a higher ISO than I usually do. Ever since I started taking pictures of food, I’ve essentially shot at the lowest ISO possible. This time, maybe because this was such a simple recipe, I thought it would be a good time to play around a bit. These grape tomatoes were shot at an ISO of 2000 ( f/5.6), I normally shoot at an ISO of 200. I thought the grain in the photo made for an interesting effect, especially in the picture below, the one with the tomatoes dressed in oil and balsamic vinegar (that particular one was shot at an ISO of 2500, f/7.1). In this next picture, the sun was beginning to set, notice the streaks of sunshine hitting the pan and the tomatoes, normally I would avoid that in a food picture, but since taking my food photography workshop and actually playing around with light, I’m starting to see it as a rather beautiful effect (ISO 2000, f/5.6). 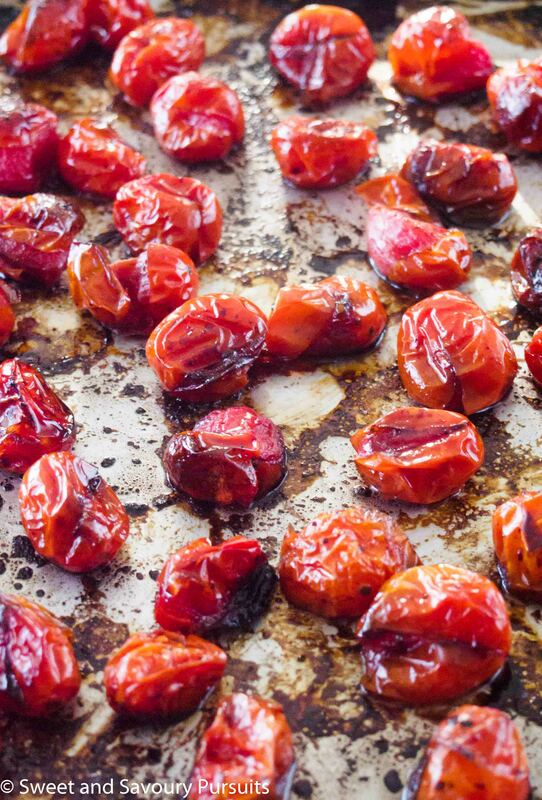 Now, let’s talk about the recipe for these Roasted Grape Tomatoes. It’s such an easy and versatile recipe. You can feel free to add herbs and or garlic to the tomatoes before roasting and if you don’t like balsamic vinegar you can leave it out. It’s quick to prepare and can be put in the oven while you prepare the remainder of your meal. You can use the tomatoes as a topping for crostini (don’t forget to add your favourite cheese and herb), as a base for a pasta sauce, or as a side (maybe with some Feta cheese sprinkled on) to a roasted main. If you have any left over you can freeze the remainder, though it would be best used in a sauce. 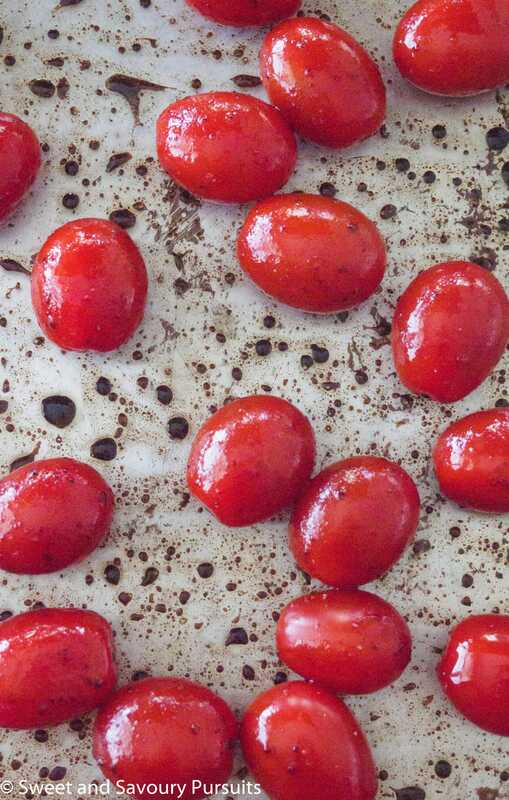 This recipe for Roasted Grape Tomatoes is easy and versatile. It's quick to prepare and can be put in the oven while you prepare the remainder of your meal. Position a rack in the center of the oven and pre-heat the oven to 425°F. Rinse the grape tomatoes, place them on a baking sheet, add olive oil, balsamic vinegar, salt and pepper. Toss them well to make sure the tomatoes are well coated. Bake in the oven for 20 minutes, stirring once after 10 minutes. Tomatoes are ready when they burst and become caramelized. Very interesting post. I like the pictures and the recipe. You have a great thing going on here. Thanks a lot for allowing me to comment. Keep those recipes coming. Thanks for stopping by and commenting Noel! These look so yummy! You have a great blog! It is interesting to know about changing the ISO setting. Lovely photos! Great to find an inspiration here to meddle with my camera! Vanilla, that’s interesting. Thank you, I’m sure someone with more knowledge could explain better, but it’s just where I’m at with photography, I look forward to learning more. I would be popping these like candy! Perfect for some bruschetta! Hi, yes this would be perfect for bruschetta! These look great! I wish I had a camera to take my food pictures with, but my Nikon is currently unavailable and now taking pics with my phone. My Szechuan eggplant food blog picture does not give its deliciousness justice! Any tips? Can u check it out and let me know what u think? Hi Abbi, took a look, I think it’s just a simple matter of changing the settings on your phone for your camera app. It just looks a bit yellowish. You have a great site! I really need to fiddle around more with my camera. Most of the time I’m in such a hurryh to try and finish my photo shoots that I just choose a setting that works for me and the food and just get a move on. My biggest challenge is taking the pictures when I’m hungry, I can’t wait to dig in! Great photos! Keep on experimenting 🙂 This is a lovely recipe, and I just happen to have grape tomatoes in my fridge. Seems like a perfect lunch with a chunk of good cheese and crusty bread!